This multipurpose light from Energizer features 7 strong white LEDS, giving a brilliant light with 360° illumination which is ideal for various purposes. It can be used as either a lantern or as a torch and it is weather and impact resistant, making it suitable for use outdoors in all environments. 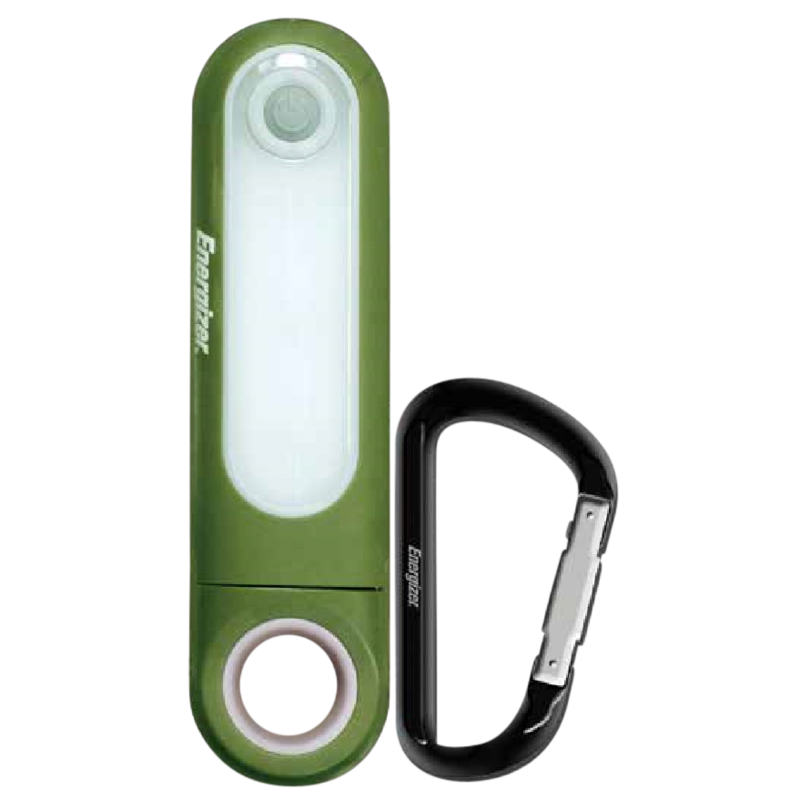 It is supplied with a high quality carabiner clip for conveniently attaching the light to tents and awnings. 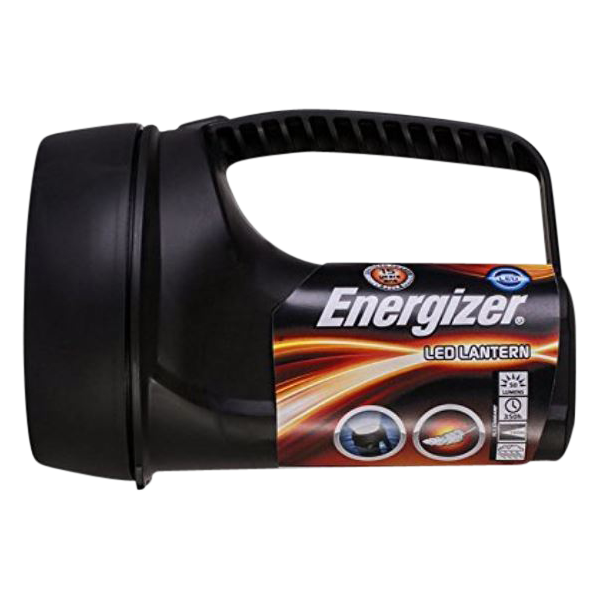 This small and lightweight flashlight from Energizer has 3 different functions (spot, area and close up) all in one handy portable device, making it ideal for a wide range of functions. It features a pivoting head and fold out legs which create a cleverly built-in tripod, as well as being water and impact resistant. Users now have more control over light output and battery life due to the use of smart dimming technology and it is supplied complete with a set of 4 x AA alkaline batteries. 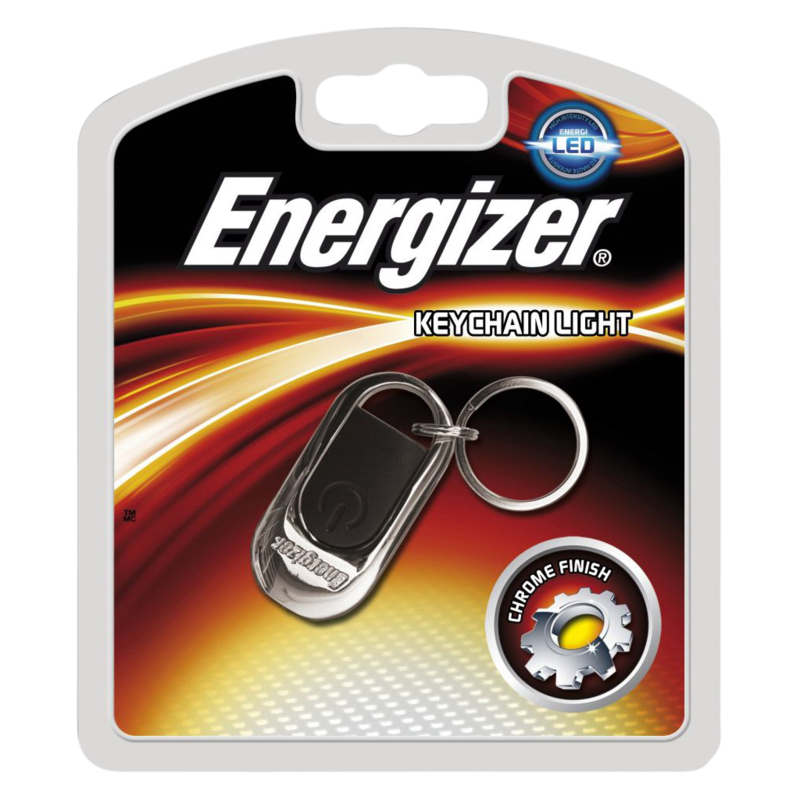 This keychain light by Energizer is a compact and convenient choice of torch, featuring a quick attachment clip which makes it easy to attach to keyrings and belt loops. With a metal construction and chrome finish, it features a Nichia white LED light and an 18 metre beam distance. This robust and durable LED Lantern from Energizer is designed to last 15 years with the same reliably powerful reflector and lens and consistent impact resistance. It has been made to float on water and has an anti-roll detail with an easy-to-grip handle and a large push button switch. It is weatherproof rated to IPX4 (not submersible), and has an impressive beam distance of 100 metres. 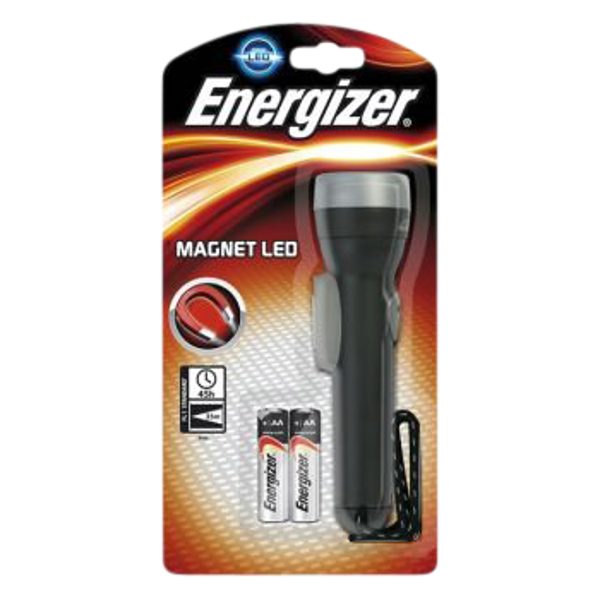 This LED Torch from Energizer features a conveniently integrated strong magnet, meaning it can be easily secured to any steel surface to allow hands-free use – ideal for keeping in vehicles. It features a shatterproof lens, a 24 metre beam distance, and it is supplied complete with a lanyard and 2 x AA batteries. 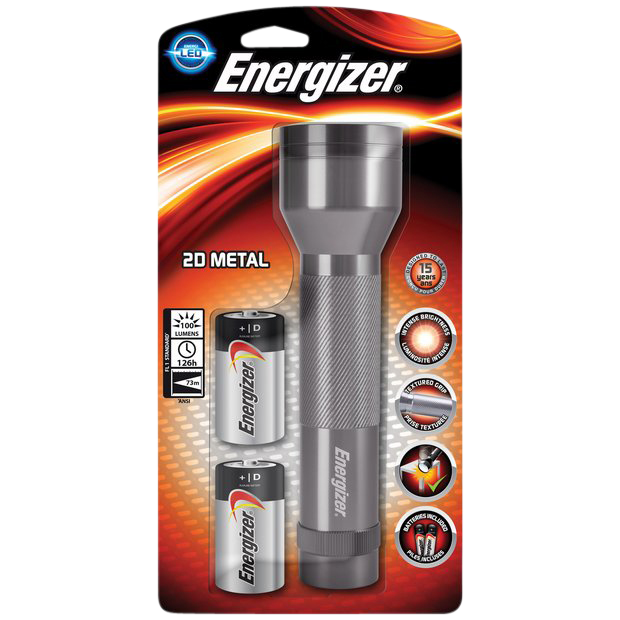 This robust yet lightweight metal torch from Energizer is impact resistant with an intensely bright white Nichia LED. It has a 38 metre beam distance and is supplied complete with batteries. 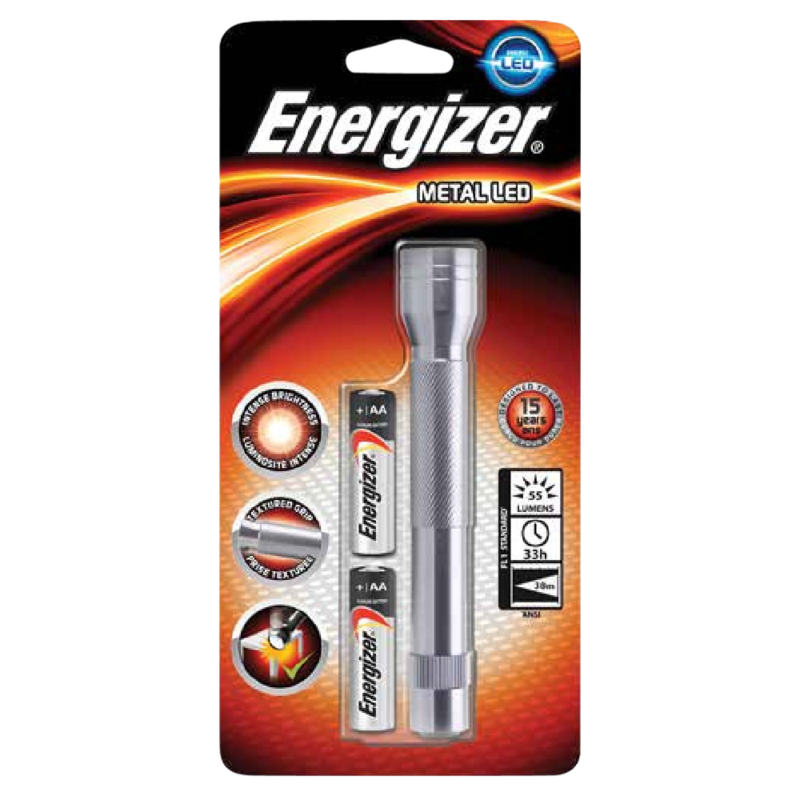 This Value Metal 2D Torch from Energizer has an intense brightness at 100 lumens with 3 Nichia LEDs. It has a robust construction with a textured grip and impact resistance and it is designed to last 15 years of heavy duty work. 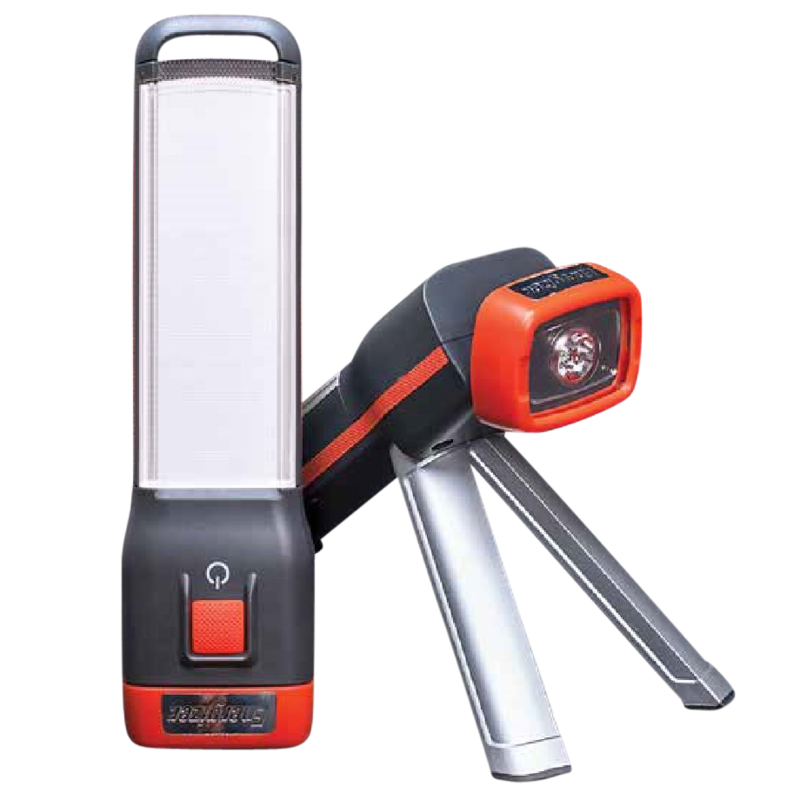 Supplied complete with batteries, this torch has a 73m beam distance and 126 hours standard runtime, as well as a large rubber push button switch for switching on and off. 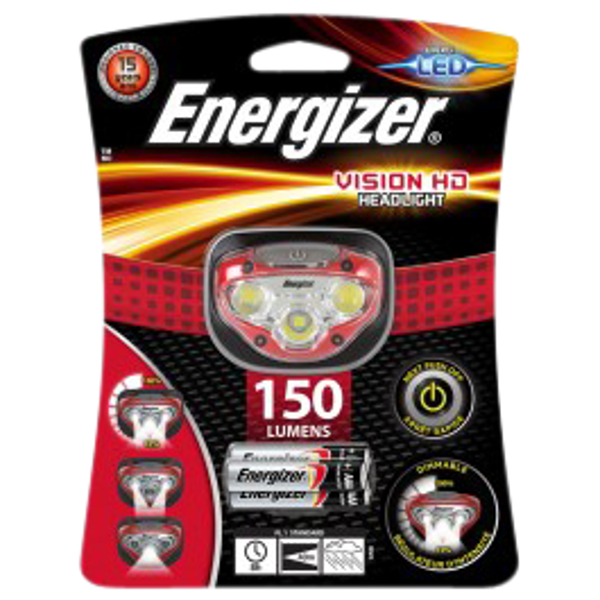 The Vision HD Headlight from Energizer is a weatherproof item that features a dimmable beam and 3 light modes. It has a pivoting head and a shatterproof lens as standard. With an adjustable head strap, maximum runtime of 50 hours, brightness of 150 lumens and a beam distance of up to 40 metres, this headlamp is a reliable choice of standard headlamp. 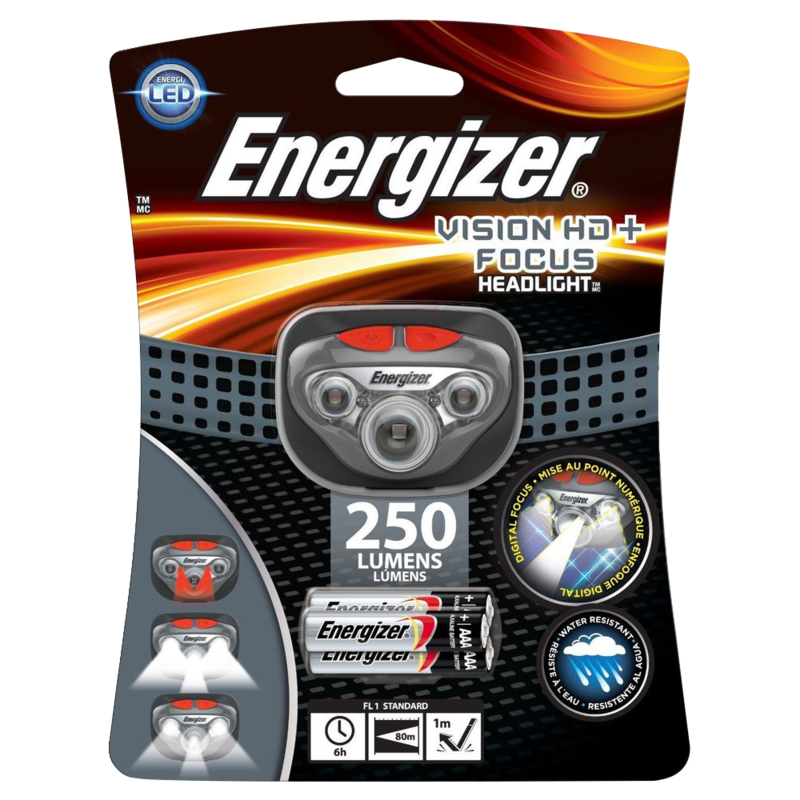 The Vision HD+ Headlight from Energizer features high quality functions, which include a red light for enhanced night vision, a dimmable beam for controlled brightness, 4 light modes and it is weatherproof rated to IPX4. With an adjustable head strap, various modes, maximum runtime of 50 hours, brightness of 200 lumens and an impressive beam distance of up to 70 metres, this headlamp is a versatile choice and ideal for most uses. 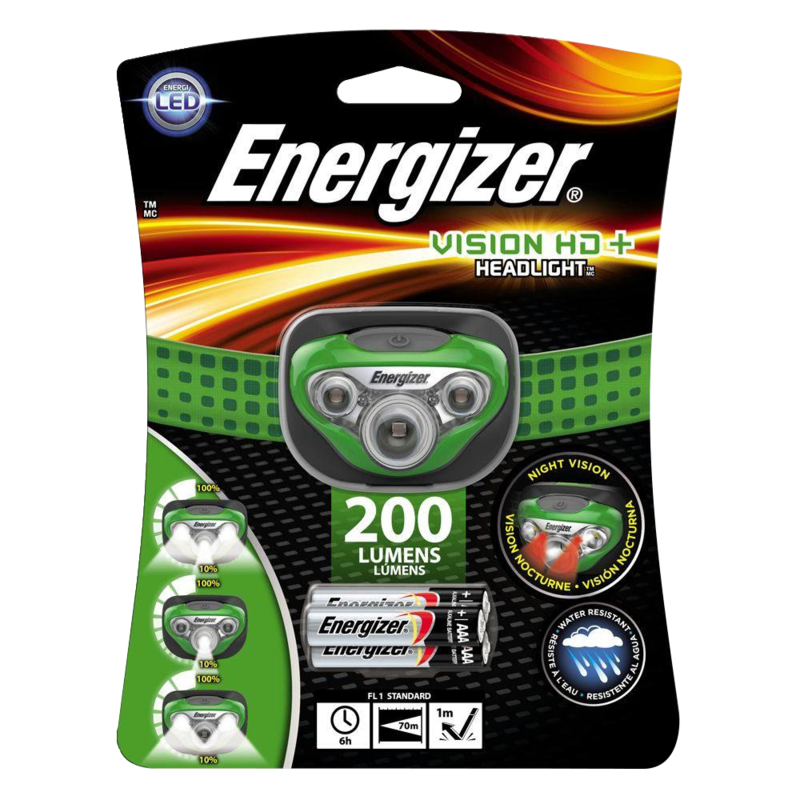 The Vision HD Focus Headlight from Energizer is a weatherproof item that features high quality functions including digital focus and memory recall, which restores focus settings to the last one used. It has a pivoting head and a shatterproof lens as standard. With an adjustable head strap, 3 light modes, maximum runtime of 50 hours, brightness of 250 lumens and an impressive beam distance of up to 80 metres, this headlamp is a versatile choice and ideal for most uses. 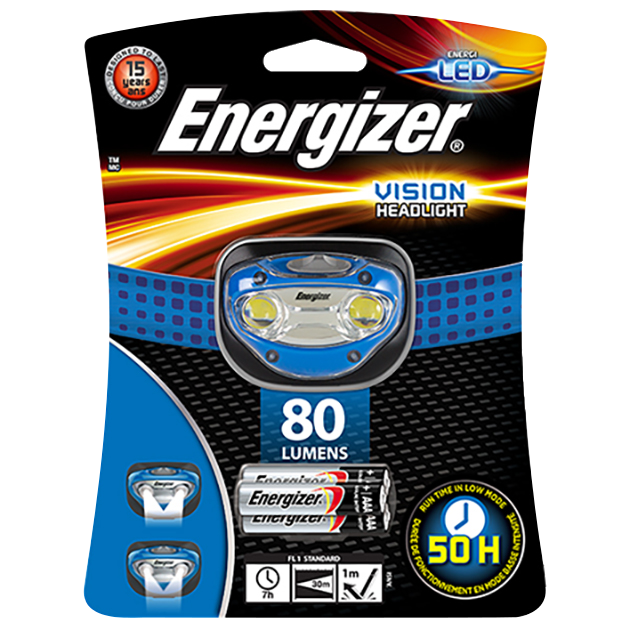 This 80 Lumens Vision Headlight from Energizer features 2 light modes (high and low), a pivoting head and a shatterproof lens, with an adjustable non-slip head strap as standard. With an impressive maximum runtime of 50 hours and a beam distance of 30 metres, this is a great standard headlamp option with handy versatile features.